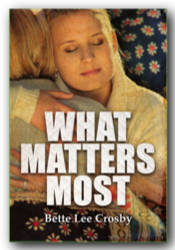 For two wonderful days, What Matters Most will be available on both Amazon and Barnes and Noble for a truly wonderful price of 99 cents…so on Tuesday, June 18th grab your Kindle or Nook and get ready for a fun read. I took advantage of the wonderful Barnes & Noble offer and happily discovered Bette Lee Crosby! Just finished What Matters Most, and with a tear in my eye, am writing to say that I have already recommended this book to my book group, and am on my way out the door to find more books by Ms. Crosby! What a wonderful read! Sooooo much for women to relate to! Can’t wait to discuss this book with my friends! thank you so much for that beautiful note. I am delighted to hear you enjoyed the book and even more delighted to hear that you are going to suggest it to your book group. If they decide to select What Matters Most (or any of my other books) as their monthly read, please let me know and I’ll be happy to join in the book club discussion either via Skype or telephone. I absolutely love talking with the gals in a book club and jump on every opportunity to do so. Once again my heartfelt thanks for your note.